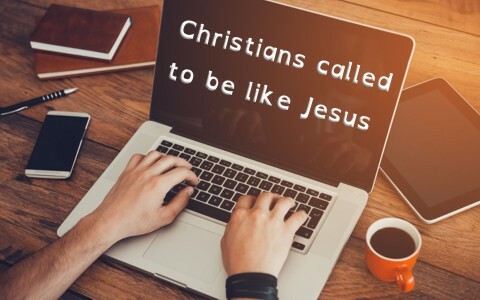 In What Ways Are Christians Called To Be Like Jesus? In what ways are Christians called to be like Jesus Christ? Christians are called Christians because they have been brought to repentance and faith in Christ. It is the “Christ” part of “Christian” that we associate ourselves with Jesus Christ Who is the Head of the Church. I heard it said that to be called a Christian is to be called a “little Christ” but there’s much more to it than that. To be a Christian means we do what Jesus did, say what Jesus said, believe what Jesus said, and live like we have done all of these things. We want to be like Jesus as much as possible and the Apostle Paul describes what Jesus is like in Philippians 2:5-8; “Have this mind among yourselves, which is yours in Christ Jesus, who, though he was in the form of God, did not count equality with God a thing to be grasped, but emptied himself, by taking the form of a servant, being born in the likeness of men. And being found in human form, he humbled himself by becoming obedient to the point of death, even death on a cross.” Since the Son of God humbled Himself to the point of emptying His Glory, or in covering the Shekinah glory that Jesus has as God, cannot we do the same and become a servant of all? This verse points to the very first way we can become like Jesus. Here was God Himself, divesting Himself of His full, resplendent glory, and coming to earth to be born of flesh but in order to save flesh and as the Apostle John wrote, “the Word became flesh and dwelt among us, and we have seen his glory, glory as of the only Son from the Father, full of grace and truth” (John 1:14). John saw His glory but He also saw His humility when Jesus washed the disciples feet….even the one who would betray Him. Since He is God and condescended down to become a servant, He is showing us the epitome of humility. God cannot ever use someone who is full of themselves because He can’t fill them! He is opposed to the proud and will only extend His grace to the humble (James 4:6). Paul talks about Christ as being in us and living in us but also says, we are in Christ, so what’s the difference? We know that believers have the Holy Spirit in them so He is both in us and with us in the sense of our fellowship and relationship to Him. To be in Christ is to be secure from the wrath of God as He is their righteousness (2nd Cor 5:21). God no longer sees the sin in us; He sees the righteousness of Christ. Paul could say with conviction that “I have been crucified with Christ. It is no longer I who live, but Christ who lives in me. And the life I now live in the flesh I live by faith in the Son of God, who loved me and gave himself for me” (Gal 2:20). That didn’t mean he was suddenly sinless (Rom 7:7-11) but like Christians, they will sin, less! Jesus puts it this way; “Abide in me, and I in you. As the branch cannot bear fruit by itself, unless it abides in the vine, neither can you, unless you abide in me. I am the vine; you are the branches. Whoever abides in me and I in him, he it is that bears much fruit, for apart from me you can do nothing” (John 15:4-5). If you’re not abiding in the True Vine, then the True Vine is not abiding in you and it’s time to examine yourself to see if you’re really in the faith (2nd Cor 13:5). A self-examination is recommended for all of us, so “be all the more diligent to confirm your calling and election, for if you practice these qualities you will never fall” (2nd Pet 1:10). We shouldn’t be surprised by suffering. Jesus promised His disciple that “If the world hates you, know that it has hated me before it hated you” (John 15:18). If you’re loved by the world and you love the world, something’s drastically wrong if you call yourself (or I call myself) a Christian, because John writes, “Do not love the world or the things in the world. If anyone loves the world, the love of the Father is not in him” (1st John 2:15). Suffering and being associated with Christ means that we are God’s Children and “heirs of God and fellow heirs with Christ, provided we suffer with him in order that we may also be glorified with him” (Rom 8:17). Suffering is part of God’s plan for Christians and as “we share abundantly in Christ’s sufferings, so through Christ we share abundantly in comfort too” (2nd Cor 1:5). This was a great desire of Paul who wrote “that I may know him and the power of his resurrection, and may share his sufferings, becoming like him in his death” (Phil 3:10). When Jesus spoke about the end of the age, He reminded His disciples that “you will be hated by all for my name’s sake. But the one who endures to the end will be saved” (Matt 10:22). Jesus speaks to the disciples as those of His own household and tells them, “It is enough for the disciple to be like his teacher, and the servant like his master. If they have called the master of the house Beelzebul, how much more will they malign those of his household” (Matt 10:25). In other words, if they accused Jesus, more than once, of doing miracles by the power of Satan (Luke 11:18-19), how can the disciples expected to be treated any differently? The Apostle Peter told the scattered Jewish Christians to “rejoice insofar as you share Christ’s sufferings, that you may also rejoice and be glad when his glory is revealed” (1st Pet 4:13) and that comes with a great blessing from God as Peter writes, “If you are insulted for the name of Christ, you are blessed, because the Spirit of glory and of God rests upon you” (1st Pet 4:14), therefore “do not be surprised at the fiery trial when it comes upon you to test you, as though something strange were happening to you” (1st Pet 4:12). Jesus was the greatest prayer warrior of all, so to be like Jesus we must be constant in prayer but to be like Jesus we must see how critical humility is; we must be abiding in His Word, so His Word will abide in us and we can be in Christ and He in us; we must not be surprised by suffering for His name’s sake, but rather be surprised if we never suffer persecution because “all who desire to live a godly life in Christ Jesus will be persecuted” (2nd Tim 3:12). All in the Greek means what it says….all! If you’re not living in humility before others; if you’re not reading His Word, the Bible; and if you’re not suffering persecution for your trust in Christ, then you may be at risk for hearing some very serious words from Jesus someday (Matt 7:21-23) because “whoever denies me before men, I also will deny before my Father who is in heaven” (Matt 10:33). Related reading here: What Would Jesus Do?